Sinister presentation of a neglected case of late onset hemorrhagic disease of newborn. Department of Pediatric Medicine, Institute of Child Health, Kolkata, West Bengal, India. Kolkata, 700017, West Bengal, India. Introduction: Hemorrhagic disease of newborn is an important cause of bleeding in an infant. Late hemorrhagic disease of newborn occurs after seventh day of life. 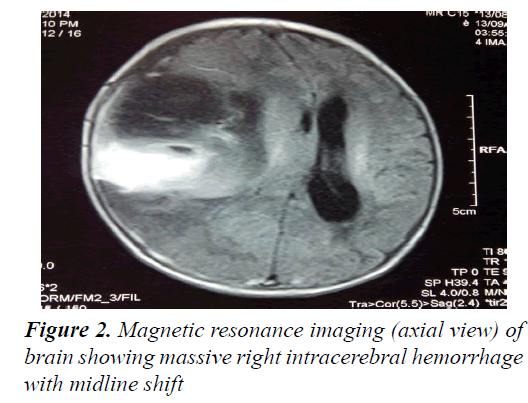 Case description: We report the case of a 2 month old infant who presented initially with unilateral subperiosteal hemorrhage of cheek and following which he developed life threatening intracerebral hemorrhage. Management with vitamin K supplementation, fresh frozen plasma transfusion and neuroprotective ventilation strategy with effective seizure control proved to be successful. Discussion: Vitamin K deficiency plays the key role by altering the prothrombin time and activated partial thromboplastin time. Among the types of intracranial bleeding in late hemorrhagic disease of newborn, intracerebral parenchymal bleeding is least common. Conclusion: Timely diagnosis of a case of late hemorrhagic disease of newborn is very crucial in preventing mortality and morbidity. Intracranial bleed, Late hemorrhagic disease of new-born, Vitamin K.
Hemorrhagic Disease of Newborn (HDN) is a common cause of bleeding in infancy . The chief etiology is vitamin K (vitamin K) deficiency. There are three types of presentations of HDN according to the time of onset-early, classical and late. Early onset of HDN occurs within 24 h of life. The main cause of early onset HDN is maternal intake of drugs like phenytoin and phenobarbitone which results in severe vitamin K deficiency in new-born by interfering with vitamin K metabolism. It usually presents as concealed hemorrhages in cranium, thorax and abdomen. Sometimes it can be present as large ecchymoses, subcutaneous hemorrhage and external bleeding. Classical HDN can occur after 24 h to 7 days of neonatal life but peak incidence is between 2 to 5 days of neonatal life and life threatening event is rare. It is common in exclusively breastfed infants. It can present as umbilical stump hemorrhage, hematemesis, malena, ecchymoses, epistaxis, bleeding from venepuncture sites, etc. It can also present with convulsion, poor sucking, irritability and pallor. Hemorrhagic disease of newborn is seen in 0.25-1.7% of neonates during the first week of life . Late onset HDN presents after day 7 of life but predominantly occurs in 2nd to 4th week of neonatal life. Its incidence is around 4-25/100000 in eastern countries . It can also present as bleeding from any site of the body but more commonly from intracranial vessels. Late onset HDN is diagnosed if bleeding occurs after 7th day of life with normal platelet count, prolonged prothrombin time (PT) and activated partial thromboplastin time (aPTT), associated with stopping of bleeding and PT/PTT returning to normal after giving vitamin K . Etiologies and risk factors of three types of hemorrhagic diseases of newborn have been shown in Table 1. Here, we present a case of a 2 month old infant with solitary maxillary swelling due to subperiosteal bleeding contributed by late HDN which was neglected initially by the parents and he presented with catastrophic intracranial bleeding later. The clinical outcome was favorable due to timely neuroprotection with early mechanical ventilation and seizure control along with vitamin K replacement and plasma transfusion. A 2 month old male infant of non-consanguineous Indian parents living in a rural area of West Bengal developed a progressive solitary swelling over left cheek. The perinatal history revealed term singleton pregnancy without any complication in mother and the baby, baby was born by normal vaginal delivery without any postnatal problem. He did not receive vitamin K at birth. The baby was on exclusive breastfeeding. After two days since the parents noticed the swelling and were planning to visit the physician, the baby started to have recurrent generalised tonic clonic seizures with uprolling of eyes and came to our emergency department. There were no history of any trauma, no family history of seizure disorder and no history of any blood related disorder in the family. On examination he was having refractory seizure, unconscious, tachypnoeic; there was tachycardia, bulging anterior fontanel, unequal pupil and severe pallor. Seizure was not controlled in spite of administering short push midazolam and loading doses of phenobarbitone and levetiracetam. Baby was promptly put on mechanical ventilator (volume control mode) and midazolam infusion was started after which seizures were controlled. Routine hematological investigation showed: Hb-6.3 g%, platelet-240000/cm, WBC count-12600/cm (58% neutrophilic, 38%lymphocytic), CRP<1 mg/dl, total billirubin 3.29 mg/dl (indirect billirubin 2.35 mg/dl); Sepsis screen, liver and renal functions, electrolytes were within normal limits. Blood and urine cultures were negative. Lumbar puncture was planned but due to baby’s unstable condition could not be executed. The coagulation profile showed: severely prolonged prothombin time (PT): 50 s, activated partial thomboplastin time (aPTT): 81.9 s and International Normalized Ratio (INR): 5.4. MRI head and neck (Figures 1 and 2) revealed huge intracerebral haemorrhage in the right cerebral hemisphere with midline shift. There was also subperiosteal bleed in the swollen cheek. Baby also received 8 aliquots of fresh frozen plasma (FFP) and 2 aliquots of packed red blood cells along with vitamin K over next 5 days. Gradually, midazolam infusion was tapered and stopped. On day 6 of admission baby was extubated. Repeat PT, aPTT, INR were within normal ranges. HIDA scan was done that revealed good uptake and excretion of bile. He had discharged after 1 week without minimal neurological sequelae with continued physiotherapy and follow up. Now his age is 6 month and is doing well. Late HDN is a rare disease with high mortality and morbidity . Late HDN may be primary or secondary to several other disorders (Table 1) [6,7]. Late HDN is one of the most frequent causes of intracranial hemorrhage in infants. None of coagulation factor cross the placenta from mother to fetus, at birth the concentration of vitamin K dependent factors (II, V, VII, IX, X) and contact factor (XI, XII) are reduced to about 50% of adult values and are further decreased in preterm infants. Lack of vitamin K administration on birth, exclusive breast feeding, chronic diarrhea and prolong use of antibiotics make them more prone to vitamin K deficiency. Bleeding occurs because of insufficient vitamin K dependent coagulation factors activity. HDN is major probability in a bleeding infant if PT-aPTT is higher and fibrinogen level and platelet counts are normal. If bleeding stops and PT-aPTT returns to normal after vitamin K supplementation then diagnosis becomes more obvious. Late HDN can present with convulsion, poor sucking, irritability and pallor. Hemorrhage of gastrointestinal system, mucosal membranes and skin can accompany the disease. Intracranial hemorrhage is the major cause of morbidity and mortality. Mortality is reported in 14-50% cases by various authors . The intake of vitamin K in exclusively breastfed babies is les then 5 μg/L but formula fed infants intake is 50 μg/L. HDN is more frequent babies who are born at home especially seen in developing countries . In our case child presented with refractory convulsion, subperiosteal hematoma of cheek and severe progressive pallor. Risk of intracranial hemorrhage in late HDN is reported in 50-80% of the cases . While subdural is the most common location for hemorrhage and subarachnoid is 2nd most common type. Zengin et al. reported subdural, subarachnoid and intraparenchymal bleeding as 100%, 80% and 30%, respectively . Differential diagnosis of intracerebral hemorrhage in an infant has been shown in Table 2. In a study of Turkey convulsion and poor feeding were seen in 47% patient and pallor in 20% . Bulging fontanel was seen in a comparable proportion of patients. Most cases in developing countries like India of late HDN are found to be born at home and not given vitamin K prophylaxis . Vitamin K prophylaxis reduces the incidence of late HDN from 5.1 cases per 100000 births by 90%. A single parenteral dose reduces the risk by a factor of 14.3 . Early intubation with neuroprotective ventilation strategies, plasma and vitamin K replacements provided very good outcome in our case. Figure 1. Magnetic resonance imaging (saggital section) of head and neck showing massive intracerebral bleed and subperiosteal hematoma of left cheek. Drugs like heparin, sodium bicarbonate, etc. To conclude, if an infant presents with solitary swelling of any bony part of the body along with history pointing towards etiologies of vitamin K deficiency, the diagnosis of late HDN should be excluded as early as possible. Failure to timely diagnosis can result in catastrophic presentations just like our case. In case of suspected intracranial bleeds due to late HDN, resorting to neuroprotective ventilation strategies along with therapy with parenteral vitamin K and plasma transfusion can decrease mortality and morbidity. Hubbard D, Tobias JD. Intracerebral hemorrhage occurs due to hemorrhagic disease of the newborn and failure to administer vitamin K at birth. South Med J 2006; 99: 1216-1220. Committee on fetus and new-born. Controversies concerning vitamin K and the new-born. Pediatrics 2003; 112: 191. Pooni PA, Singh D, Singh H, et al. Intracranial hemorrhage in late hemorrhagic disease of the new-born. Indian Paediatr 2003; 40: 243-248. Ijland MM, Pereira RR, Cornelissen EA. Incidence of late vitamin K deficiency bleeding in new-borns in the Netherlands in 2005: Evaluation of the current guideline. Eur J Paediatr 2008; 167: 165-169. Waseem M. Vitamin K and hemorrhagic disease of new-borns. South Med J 2006; 99: 1199. Lane PA, Hathaway WE. Vitamin K in infancy. J Pediatr 1985; 106: 351-359. Singh M. Vitamin K during infancy: Current status and recommendations. Indian Pediatr 1997; 34: 708-712. Bor O, Akgun N, Yakut A, et al. Late hemorrhagic disease of the new-born. Paediatr Int 2000; 42: 64-66. D?Souza IE, Rao SD. Late hemorrhagic disease of new-born. Indian Paediatr 2003;40: 226-229. Flood VH, Galderisi FC, Lowas SR, et al. Hemorrhagic disease of the new-born despite vitamin K prophylaxis at birth. Paediatr Blood Cancer 2008; 50: 1075-1077. Zengin E, Sarper N, Türker G, et al. Late haemorrhagic disease of the new-born. Ann Trop Paediatr 2006; 26: 225-231. Sutor AH, Dagres N, Niederhoff H. Late form of vitamin K deficiency bleeding in Germany. Klin Pediatr 1995; 207: 89-97.